Going deep down into the emotion and consciousness, and sinking into a light that contains everything, ready to be embraced, to be healed, to be protected, to emerge, to be a whole. With a pure attitude, AT-ONE-MENT pursues female consciousness, emotion, and soul, dedicates to explore the most delicate dressing experience. It’s a fashion expression of the spiritual experience of its founder and designer Wanbing Huang, and it is also a living being that embraces art, spirituality, and awareness. The designer combines sensibility, art, experimentation, and innovation in her Spring/Summer 2019 collection which explores female’s most subtle emotions and their journey of finding themselves. The silhouettes are more fluid and romantic; all the sharp edges are hidden invisibly, turning into elegant dresses, which sets oﬀ extreme femininity also creates a slenderer body shape. With ingenuity design on the shoulders, legs, and chest, allows the wearer to show the subtlest curves, as well as give them more space for free movement. The evening gowns with more draping keep the romance alive. Moreover, power and pride of women are embedded into a series of tailoring suits, with a dashing glamour. The pastel blue and rosy pink bring a lightsome touch to the whole collection while the ink-like midnight blue plays the bass of it with ginger yellow and copper color. The designer presents her innovative signature fabric again, using peony-patterned jacquard to express the romantic and charm, she also uses small “star-like” jacquard to enhance the contrast and texture. Through overlapping of lace and organza, she not only makes the silhouette more prominent but also creates subtle polarized hues. She also uses exquisite craftsmanship of embroidery to create three-dimensional floral decorations, making the garments more layered. The designer also continues the previously acclaimed design into this collection. The “body accessory” concept changes the half-piece dress into playful accessories. 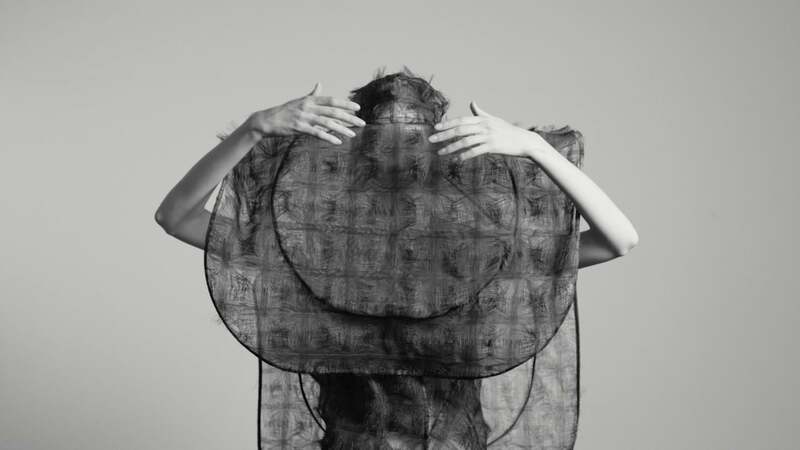 Those gigantic oversized hats, which was initially from Huang’s graduation collection are paired with gloves to create a mysterious atmosphere of the ceremony. The final piece is also the climax. The jumpsuit made of soft pink lace shows the designer’s original heart ̶̶to create garments with emotion, giving them life and making them a part of the emotional experience. It also symbolizes that female will eventually emerge from the cocoon and find a new life in the light. AT-ONE-MENT is a premium fashion brand launched by London-based designer Wanbing Huang in 2018. AT-ONE-MENT means “all-in-one” and “unity.” The designer believes it is the unfolding of one’s consciousness to the point that embracing by the light, then one will find the “true self.” AT-ONE-MENT upholds the design concept of putting extraordinary artistic aesthetics, unique silhouette and innovative fabrics all to one place, which captures the subtle but dynamic consciousness of the wearer, highlights the beauty of women and creates a feminine image with extreme elegance and spiritual connotation. Award-winning designer Wanbing Huang is committed to exploring conscious complexity. She regards fashion as an essential carrier to show women’s emotions and bring them spiritual resonance and comfort. Graduated from Central Saint Martins in UK and Bunka Fashion College in Japan, Huang has interned in renowned fashion houses like Céline and Issey Miyake. Her collections were shown at London Fashion Week’s Designer Showroom and Labelhood of Shanghai Fashion Week. She has been featured by Vogue, BoF, W, Harper’s Bazaar and i-D for her outstanding design. She has also been invited by Nike on a global creative project and exhibited her design and installations at LVMH’s headquarters and The Times Art Museum in Beijing. The artistic approach and experimental spirit is Huang’s uniqueness.